Ticker Sense: Financial Sector Has Best Six Day Move EVER! 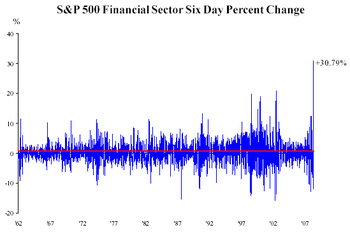 Financial Sector Has Best Six Day Move EVER! Based on Birinyi Associates' sector data, which dates back to 1962, the S&P 500 financial sector has had its best six day move ever. The move puts the sector in the middle of its trading range, at the 50-day moving average. I tried to time the bottom of financials (can anyone really do that) by going long on July 14th and got hammered but fortunately made it back. The new short-sale's rule helped tho.